Growing your own food and medicinal herbs is a worthy use of garden space. But, what happens when you have limited garden space and want to add natural dye plants to the mix as well? One solution is to find plants that will pull double duty for your herbal medicine cabinet, and your natural dye vat. The following seven herbs are among my favorite, colourfast, double-duty herbs. Some of these plants require more warmth, while others can be wild crafted. Some will thrive as “weeds” in your garden. A few of these plants will do very well for container gardening, or can masquerade as ornamental flowers. Evaluate what you have in your vicinity, and see how these plants might work for your health and natural dye goals. Turmeric (Curcuma longa) is reliable as a spice, a medicinal herb, and a natural dye. Well known in prepared mustard, as the yellow stain that will never wash out, turmeric is a very bright, and very permanent yellow dye. Thriving in warm climates, in zones 7b to 11, turmeric can be grown as a perennial in the ground. If you live in a cooler growing zone, turmeric can be grown in a pot, which is brought indoors in winter. 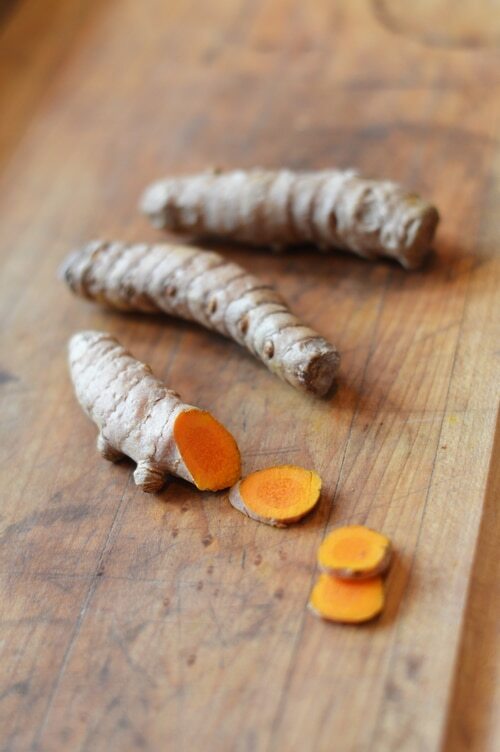 You can even start turmeric from a piece of store-bought root, like I did. Once it starts growing, it will give you a perpetual harvest. You can harvest the roots as a spice, for medicine, or for your natural dye vat. Simply replant one of the pieces of root, after harvest, to insure a continued supply. To use turmeric as a natural dye, grate or chop the fresh root. Simmer the root with plenty of water for several hours and then strain the dye liquor. Add your alum mordanted fibers to the strained vat. Simmer for half an hour to an hour with the fiber in the vat, and remove. The first bath should give you a very brilliant, sunflower yellow. Add more fiber to the vat, and simmer for the same length of time to get paler shades as the vat is exhausted. Check out this post on the medicinal benefits of turmeric. 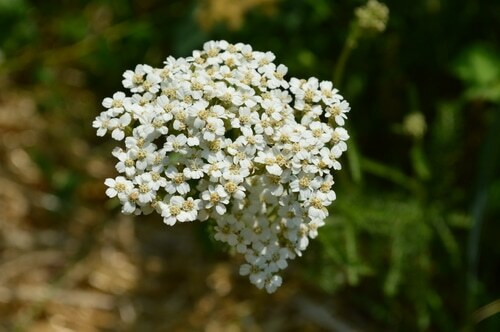 Yarrow (Achillea millefolium) is a beautiful flower that can masquerade just as easily in the ornamental flower garden as in the herb garden. Yarrow is a self-seeding perennial, and will thrive zones 3 to 10. In my area, white yarrow grows wild, with the odd pink yarrow showing up. You can purchase seeds for orange, red, and yellow yarrow as well. The more colorful yarrow has a weaker herbal action than the wild plant, however its natural dye color, which comes from the flavonoids in yarrow, is just as strong. Like turmeric, yarrow is a natural yellow dye, and the same parts used for herbal preparation are used to achieve the natural dye. You use the flowers, and sometimes the leaves, either fresh or dried. Yarrow sometimes requires the addition of an alkaline, like a teaspoon of baking soda, to the dye bath to get a pure yellow. 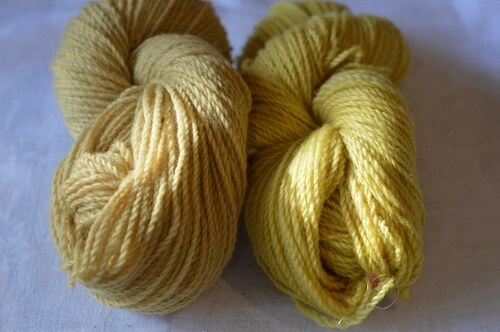 Most natural yellow dyes use the same basic dye vat method. Steep the plant matter in simmering water. Strain the dye vat. Then simmer your mordanted material in dye liquid, and enjoy the resulting color. Find out more about the medicinal properties of yarrow. Mullein (Verbascum spp.) is a wild herb and natural dye plant, thriving in disturbed and dry soil. Mullein is a biennial, which is hardy in zones 4 to 9. Mullein has a fuzzy leaved rosette in its first year, and a tall flower spike in its second year. The preferred material for dyeing are the first year rosettes, however second year leaves harvested from the stalks will also work. The material used for medicine includes both the first year leaves, and the second year flowers. Always keep in mind which parts of the plant are preferred for herbal use, or dyeing, so you don’t end up over harvesting for one and missing the other. Mullein is one natural yellow that requires the addition of an alkali, to the dye vat, to achieve a clear yellow. Otherwise, you’ll end up with a khaki brown color. Try adding a teaspoon of baking soda to make a stronger yellow. 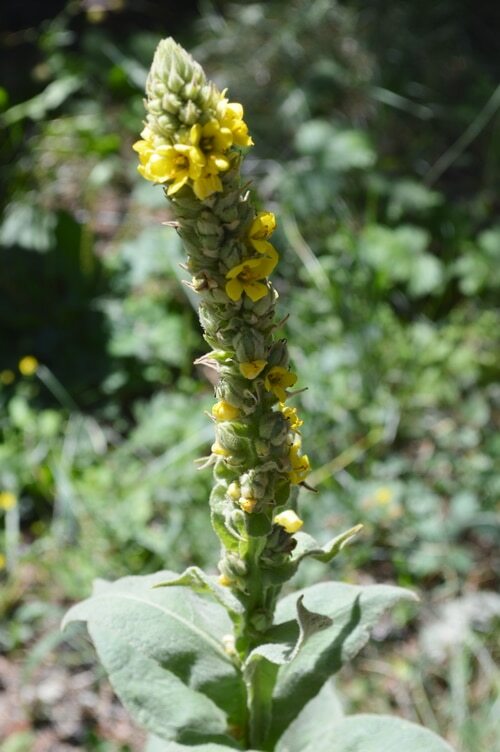 Find out how mullein is used medicinally. 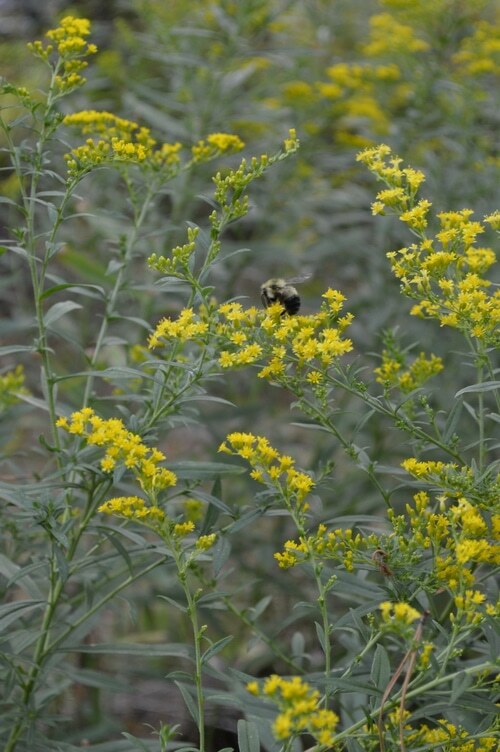 Goldenrod (Solidago canadensis) is an attractive perennial that is loved by native bees. It thrives in slightly disturbed and open soils, in zone 3 to 8. Goldenrod’s flowers are a customary sight, in mid-summer, on the edges of roads, paths, creeksides, and abandoned lots. This plant propagates and spreads by rhizomes, so planting it in locations where its roots will be prevented from spreading is essential. The valued part of goldenrod is its golden flowers, both for their natural dye properties, and for their medicinal properties. Goldenrod is another yellow dye, and is one of the most colorfast of the natural yellows. It was used commercially in europe prior to the invention of chemcical dyes. For dye, you can use either fresh or dried goldenrod flowers. The whole above-ground stalk will give both a strong yellow natural dye, and an herbal medicine useful for colds and flu. Follow the directions for other yellow dyes. Learn more about the medicinal properties of goldenrod. Marigolds (Tagetes erecta) are an annual that is rich in yellow dye. While marigolds themselves are valued for companion planting because of their ability to combat root nematodes, the African marigolds are also a strong source of lutein and zeaxanthin, retinal nutrient, used to improve vision in patients with retinal degeneration. Ironically, the flavin lutein is the component of the flower that gives the yellow dye. The flowers added to chicken feed will also give egg yolks a deep yellow colour. Depending on your growing season, and level of summer warmth, there are actually several different varieties of marigold that can be grown. Some are insecticidal, and some produce edible flowers. But all of them will give you a natural yellow dye. The larger flowers, however, of Tagetes erecta, are prolific and make collection easier. Marigold flowers can be used either fresh or dried for natural dyes. 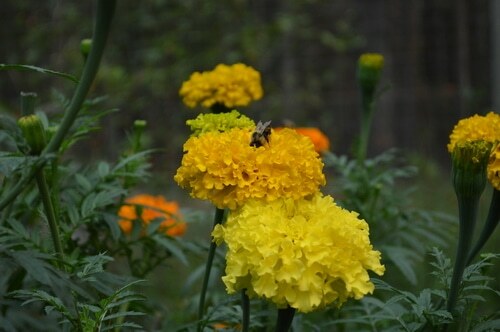 Harvesting the marigold flowers throughout the growing season will also stimulate the plant to produce more flowers. You’ll be able to keep harvesting flowers until you have a killing frost. Learn how to use marigolds to make a supplement for eye health. Galium aperine is a perennial that grows in zones 3 to 8. It is from the Rubiaceae, or madder, family. The above ground portion, leaves, flowers, and seeds, are used for herbal medicine. With cleavers it is the roots, that provide the red dye. Roots for dyeing should be harvested in the fall. Choose the largest roots, and then either use them fresh, or dry them for later use. Red dye vats are prepared similar to yellow dye vats, except for one thing. A red dye bath should never reach the boiling point; otherwise it will lose the red color. To get the brightest red, an additional mordant process may be required. Cleavers is a bitter, and acts as a diuretic, aperient, and mild astringent. It is effective as a blood purifier, and can be used externally, as a poultice, to cool scalds and burns. For internal use, the leaves are used as a tea infusion, or a tincture (The Way of Herbs by Michael Tierra). This is my favorite plant, not only for dyeing, but for its awesome herbal properties. Woad (Isatis tinctoria) is one of the few broad spectrum antibiotic plants. In the dye world, woad is one of the few blue dye plants. 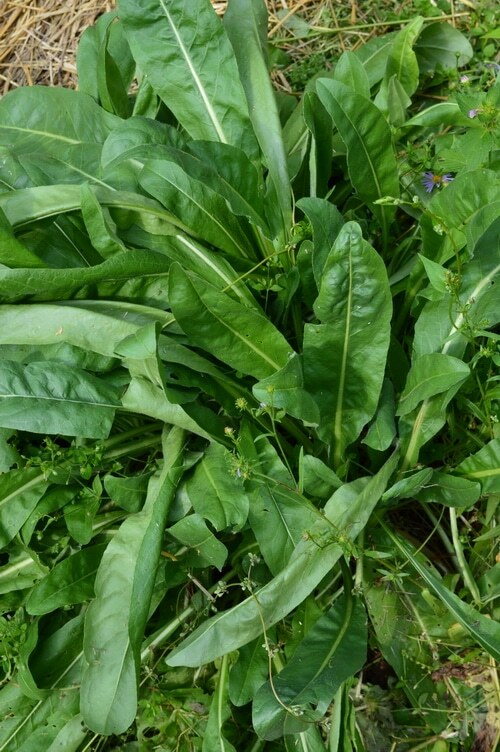 While both woad leaves and roots are used in herbal preparations, it is only the leaves that are used in natural dyeing. Woad is a biannual plant, with the first year leaves being preferred for dyeing, and the fall first-year roots being preferred for medicine. Woad will produce a large number of seeds, and has been classed as a potentially invasive plant in the Western states. However, if you are using it for both dye and medicine, you probably will not have a problem. Just don’t let it self-seed in its second year. The colors achievable from woad are wide and varied, if you want to know how to extract blue from the woad plant, or any of its other beautiful colors, you can check out “extracting indigo from the woad plant” and “the colors of the woad plant” on my own blog, Wearing Woad. 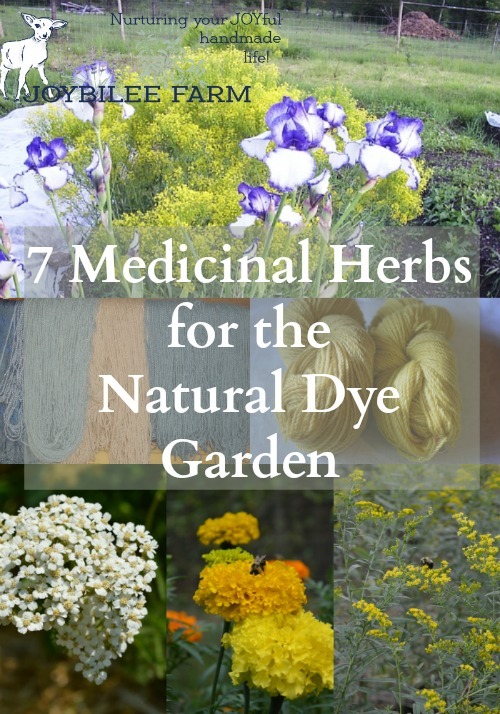 Are you ready to explore natural dyes from your herb garden? 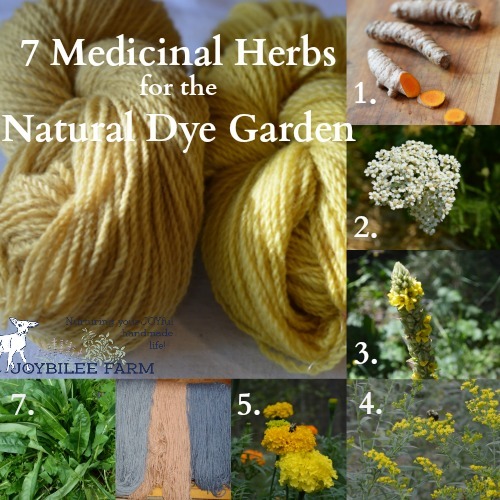 Using these 7 double-duty herbs will give you the three primary colours in your natural dye vat, with cleavers for red, woad for blue, and the 5 other plants for varying shades of yellow. Once you begin playing with natural dyes, you’ll notice that the colours are not just one colour. 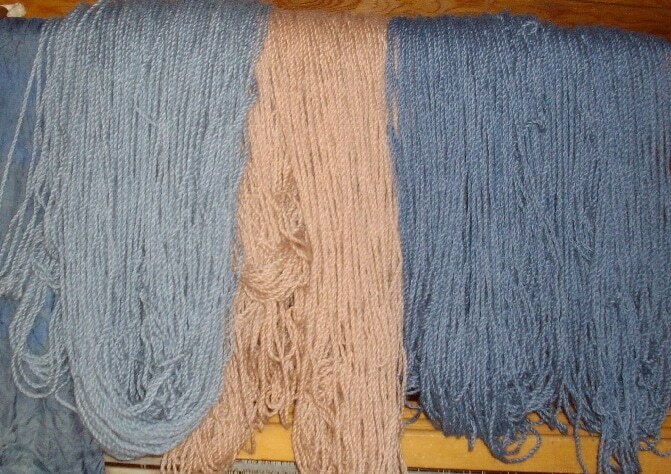 Each natural dye shade is made up of many different hues. These different hues can be over dyed with other hues to give you every colour of the rainbow. Add an after dip in iron water to sadden the colour or a dip in copper water to shift the colour toward green. You’ll be amazed at the depth of colour you can achieve with these plants that serve as medicinal as well as natural dye herbs. And you won’t have to give up much garden space to do it.